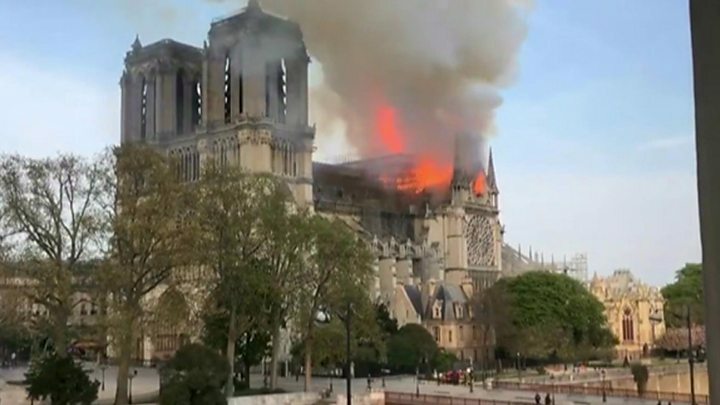 A major fire has engulfed one of France’s most famous landmarks – the medieval Cathedral of Notre-Dame in Paris . A Paris fire official said the main structure had now been “saved and preserved”. Loud bangs could be heard as flames burst through the cathedral’s roof, also destroying its stained-glass windows. All efforts are now being put into saving the cathedral’s artwork and preventing the collapse of its northern tower. 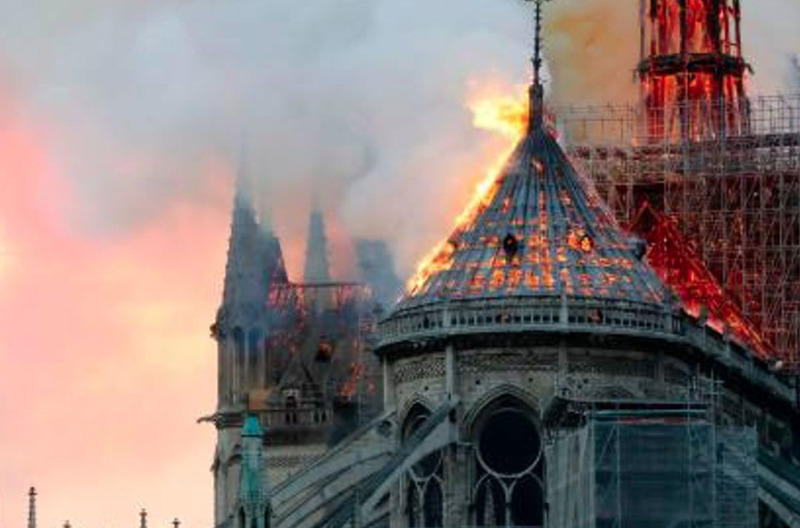 A spokesman for the cathedral said the whole structure was “burning”. “It remains to be seen whether the vault, which protects the cathedral, will be affected or not”, he said. 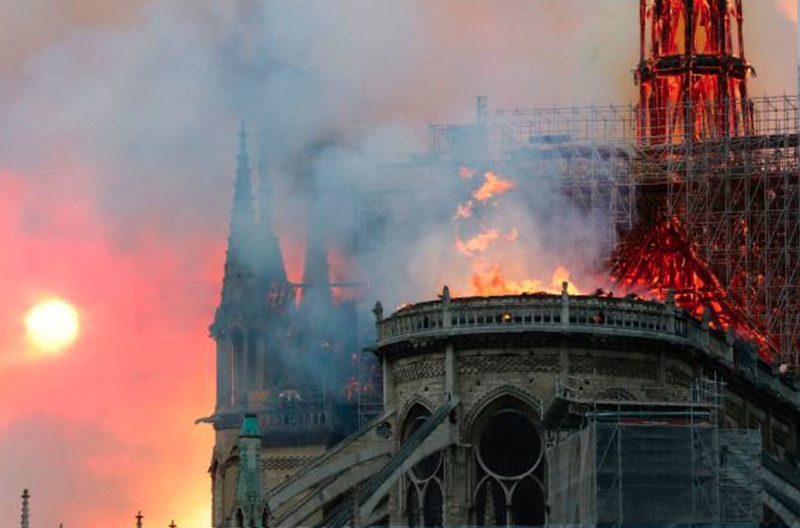 “Happy and unfortunate events for centuries have been marked by the bells of Notre Dame. “We can be only horrified by what we see”. “There are a lot of art works inside…it’s a real tragedy,” she told reporters. It has given its name to one of the country’s literary masterpieces. Victor Hugo’s The Hunchback of Notre-Dame is known to the French simply as Notre Dame de Paris. “I have a lot of friends who live abroad and every time they come I tell them to go to Notre-Dame,” eyewitness Samantha Silva told the Reuters news agency. US President Donald Trump suggested “perhaps flying water tankers” could be used to extinguish the fire. “My thoughts are with the people of France tonight and with the emergency services who are fighting the terrible blaze at Notre-Dame cathedral”, UK Prime Minister Theresa May said in a tweet. The Vatican has said news of the fire has caused “shock and sadness,” adding that it was praying for the French fire services. The Notre-Dame cathedral, a popular tourist attraction, was undergoing renovations after cracks began to appear in the stone, sparking fears the structure could become unstable. Last year, the Catholic Church in France appealed for funds to save the building.